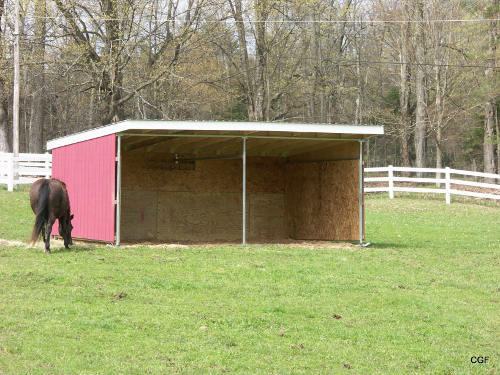 The Maverick Run In Horse Shelter Kit is the toughest building frame that you will find anywhere that can withstand the abuse that horses and livestock can dish out! These durable steel building shelter frames are built to withstand not only the snow and wind, but the test of time as well. These shelter frames are completely portable so you can pull them to a new location time and time again! Your horses will love this loafing shed. Call 812-614-4364 or email us for delivered prices. The Maverick Run In Horse Shelter is available as a DIY kit, which includes all finish materials or just the galvanized steel frame. Our Maverick Run-In Shelter has been one of our most popular products since 1949. 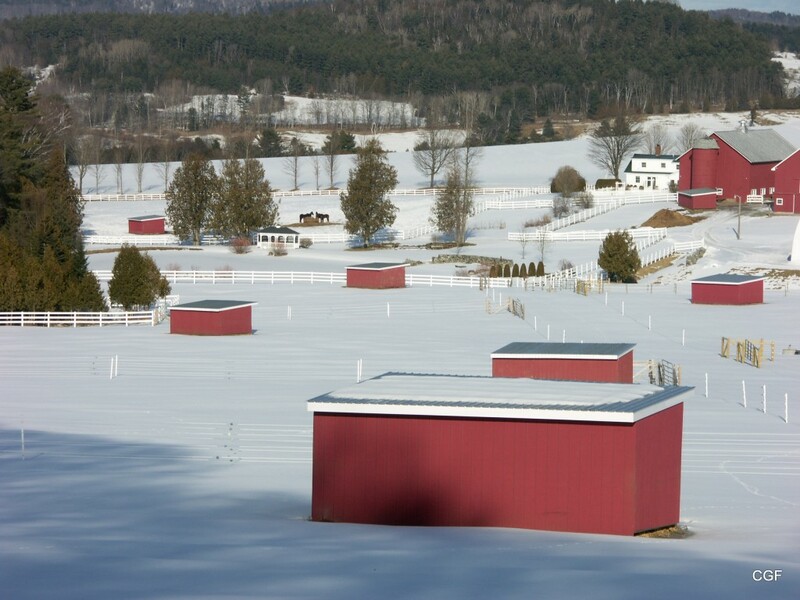 This three sided shed makes for a great shelter for horses, cows and other livestock. It’s heavy duty steel pole frame is made from 2 ½” galvanized steel tubing. It’s light weight but extremely durable and designed to last a lifetime. Choose to order the Maverick’s frame only or a complete DIY Kit. Klene Pipe Structures will include everything you need to create a beautiful shelter for your livestock. Each run-in shelter kit is delivered right to your location and comes with all necessary materials – Lumber, Patented Steel Frame, Trim, Kick Boards and all necessary Hardware. We also include a step by step instruction guide for your convenience. Our kits are great for the handy DIY’ers but save you the hassle of gathering up all of the supplies. Easy to Build – DIY Kit or Frame Only. Both include a instruction guide for your convenience. Durable – Made from our heavy duty 2 1/2 “galvanized steel tubing. Portable – Easily portable, no need to completely dismantle simply hook onto the runners and slowly drag it to the location of your choice. Customizable – Customize your Maverick Run-In Shelter to Your Farm’s Exact Needs. See a list of options below. Standard Height – 8’ front and 7’ back. This size fits most horses and livestock. Oversized Height – 10’ front and 8’ back. This size is designed for taller animals such as draft horses. *Custom lengths available in any 10’ or 12’ increment. Extra Protection – Add on optional protection from the rain and snow. Choose to add on your own DIY additions such as front walls, stall dividers or doors. Unfortunately Klene Pipe does not supply walls, dividers or doors, but you can build your own. Let us know your planned upgrades and we’ll include extra support for your future additions. DIY Kit or Frame Only– Choose between just the heavy duty galvanize steel frame, or our more popular DIY Kit. The full kit is delivered right to your door including everything you need – Lumber, Steel Frame, Trim, Kick Boards and all Necessary Hardware. * Free delivery to the contiguous U.S. Some restrictions may apply.